These tacos are a smokey and spicy dance for the tongue. Remember this chicken started as a sheet pan of roasted chicken breasts with some roasted tomatoes and green beans. In Big Cooking – Chicken Part 2, I made some chicken salad. 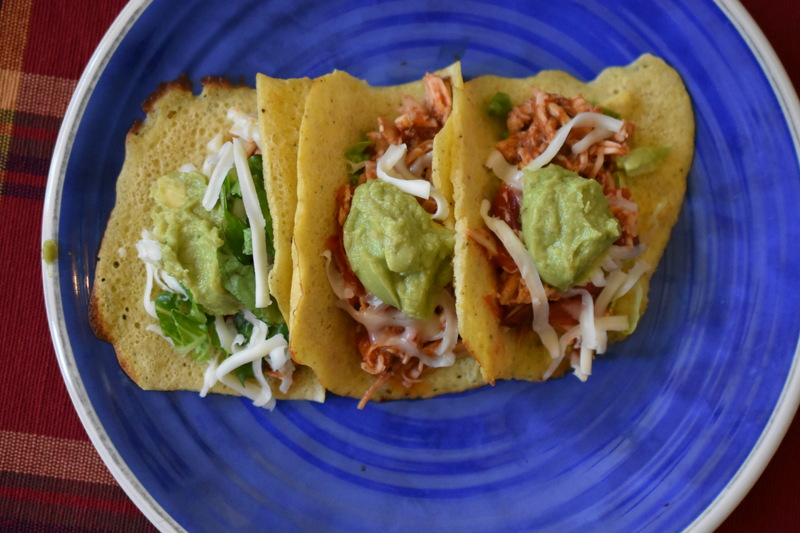 Now in Big Cooking – Chicken Part 3, I have made for you Chipotle Shredded Chicken Tacos. These tacos only took thirty minutes to make, and that includes making the Plantain Tortillas from scratch. Oh, I adore these tortillas. They counterbalance the smokey and spiciness of the shredded chicken to make the perfect bite. I am excited for you to try these. They are just so good. This is the time to make the plantain tortillas. I highly recommend these tortillas. While the tortillas are baking (15 minutes) in the oven, shred the chicken with two forks into a large bowl. This is the fun part. Squeeze the cherry tomatoes into the chicken. Be careful, they are really juicy from when you roasted them. Break apart the tomatoes. Add peppers, Smokey Southwestern Seasoning, salsa and lime juice. Stir well. In a non-stick pan, over medium heat warm chicken until heated through. Build your tacos. Serve. Eat. Enjoy. Note: I actually had some of this chicken leftover. Plus, I still have 1 1/2 chicken breasts to use for at least one more meal. Thank you. These are so good. Catherine, I loved the way you have laid out your site. I just picked a category at random and landed on the chicken taco recipe, with plantain tacos no less! Will definitely give those a try. Thanks for checking out my site: Secret Spice Kitchen. I will definitely return to see what you’re up to here! Thanks. I will visit Secret Spice Kitchen again. The combination is the perfect bite.